petition: Stop Using Our Money To Secretly Fund The NRA's Racist Attacks! The NRA is notorious for its extreme agenda and dedication to undermining common-sense gun reform. Do you know that it also traffics in racism? 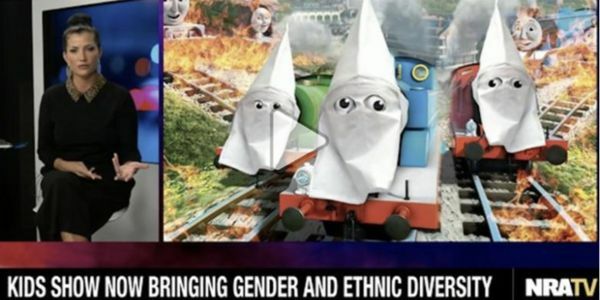 The organization recently went so far as to dress beloved children's characters in KKK hoods to ridicule and protest diversity on children's television. It sounds outrageous, but it's true. The NRA's toxic power comes in large part from corporate funders with deep pockets like Smith & Wesson – which made the AR-15 that killed 17 people in Parkland, Florida. Now American Outdoor Brands, the owner of Smith & Wesson, has been caught secretly using shareholder's money to fund the NRA. This means that anyone with a pension, mutual fund, or retirement account could be unknowingly funding the NRA and it's hateful tactics. The good news is that on Tuesday, shareholders of Smith & Wesson have a major opportunity to hold the company accountable. They'll vote on a resolution demanding the company report on what it's doing to improve safety and stop gun violence, and on whether a particularly problematic board member should be ousted. Your voice can help make sure Smith & Wesson's largest investors vote with us. We need investment companies like BlackRock and Vanguard, two of the company's largest shareholders, to stand up to Smith & Wesson. Millions of Americans have their retirement and other savings with BlackRock and Vanguard – they should side with safety-minded Americans who are willing to stand up against harmful decision-making at gun manufacturers and the NRA. Sign the petition and join us to call on BlackRock and Vanguard to hold Smith & Wesson accountable. On September 25th, you have the opportunity to vote for a resolution that would be an important step towards greater accountability and transparency at one of the largest gun manufacturers, American Outdoor Brands Corporation (AOBC). In 2016, AOBC gave $1.5 million to the National Rifle Association (NRA) and National Shooting Sports Foundation (NSSF), and failed to disclose it even though a majority of AOBC shareholders have called on them to do so.​ At a time when the NRA is launching outrageous, racist attacks on diversity – including an "NRA TV" segment which depicted beloved children's characters in KKK hoods – this means that shareholder money is being used to fund offensive and harmful racist propaganda. The company is also dragging its feet on improving the safety of its products, ignoring evidence that its customers want better safety measures. AOBC also failed to disclose what we view as a significant conflict of interest of one of its board members. We are calling on you as a major fund manager to demand greater accountability from AOBC by voting for the resolution brought by Sisters of the Holy Names of Jesus and Mary, U.S.-Ontario Province. And we are calling on you to follow the recommendation of Glass Lewis and withhold support from director Mitchell Saltz's re-election, for failing to disclose his business interests and board service at a public company that appears to have competed with AOBC.